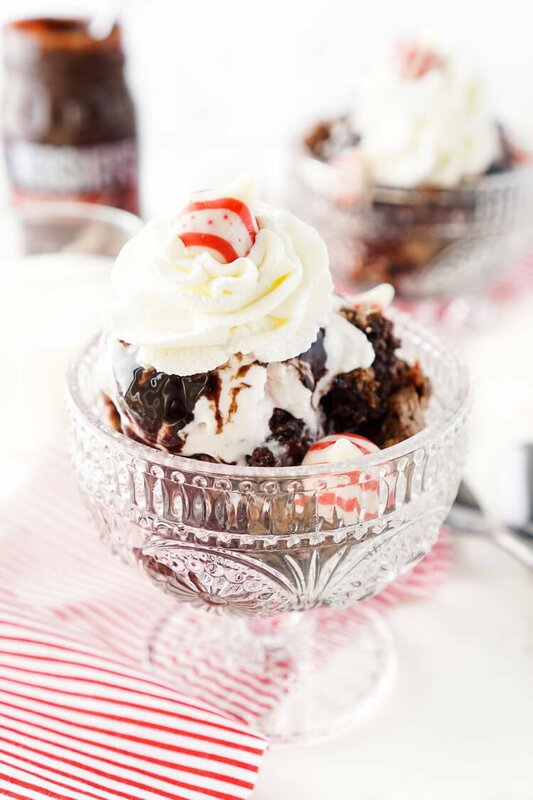 These Peppermint Kisses Brownie Sundaes are a dessert the whole family can make and enjoy together! Our first snowfall hit early Monday morning and with it comes “Minter”, you know, that time of the year when everything is mint flavored! Some of us love it and some of us hate it. Personally, I’m not a huge fan of the minty overload that tends to hit, but I do enjoy the combo of mint and chocolate when it’s done right! 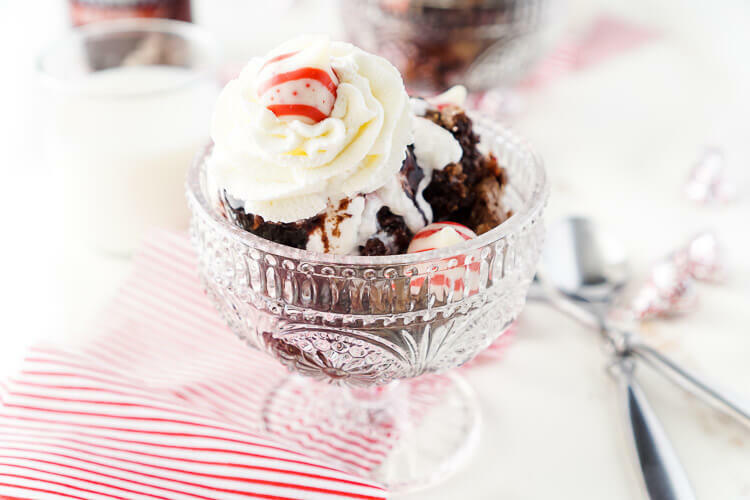 I’m excited to be teaming up with The Hershey Company to bring you these Peppermint Brownie Sundaes as a great example of an easy holiday dessert option! 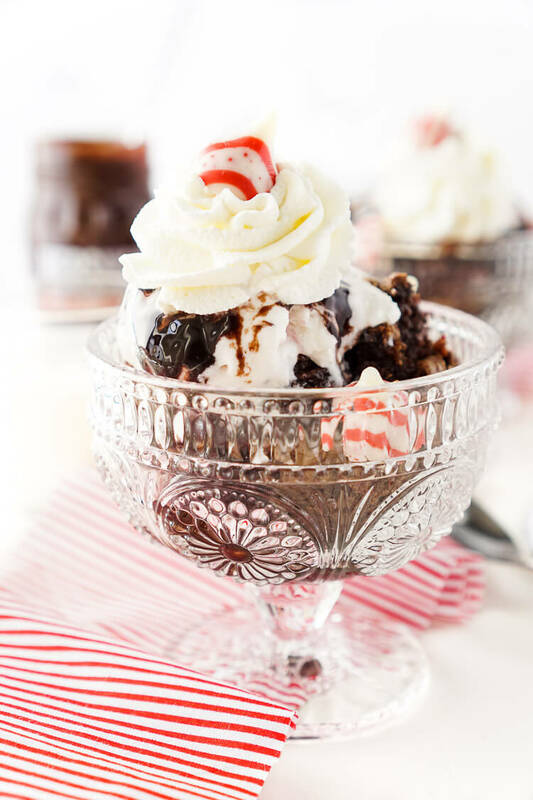 A classic fudgy brownie with Hershey’s Candy Cane Kisses baked right in and finished off with a scoop of creamy peppermint ice cream, hot fudge, and whipped cream. Sounds pretty decadent, right? Well, IT IS pretty decadent and it’s absolutely delicious and full of holiday flavor. I know for the most part we’re pretty over ice cream by the time the snow hits, but when it comes to brownie sundaes, seasons don’t matter. With warm brownies and hot fudge, that ice cream is going to become as cozy as any cookie. I mean, just look at that bowl of holiday deliciousness, there’s definitely no reason you wouldn’t want to pick up the fixings and get these brownies baking in the oven stat! 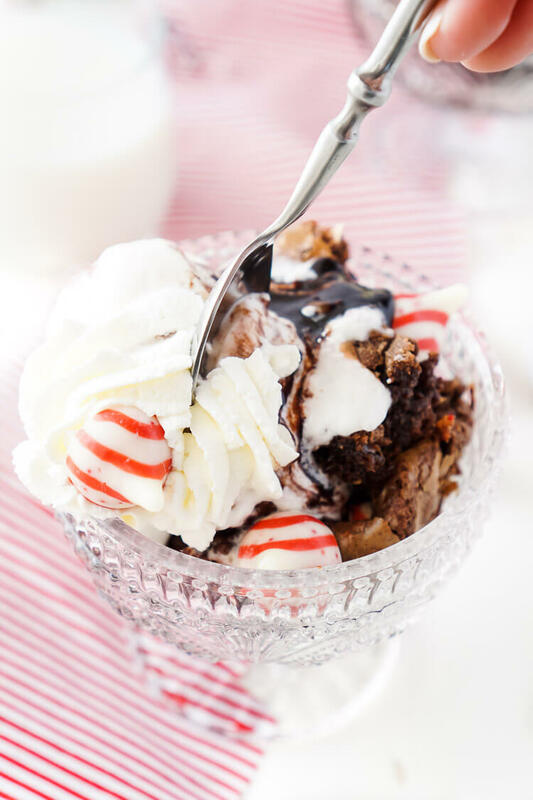 Plus, I’m going to make it even easier by sharing this step by step video with you on just how simple these Peppermint Kisses Brownie Sundaes are! Line 8x8 baking dish with parchment paper. Combine flour, salt, and baking soda together in a small bowl and set aside. In a large bowl, whisk together eggs, brown sugar, and oil for 2 MINUTES! Whisk in water and vanilla extract until fully incorporated. Melt 1 cup chocolate chips in microwave on 30 second intervals until melted, stirring in between, about 60 seconds. Whisk melted chocolate into the brownie batter until fully combined. 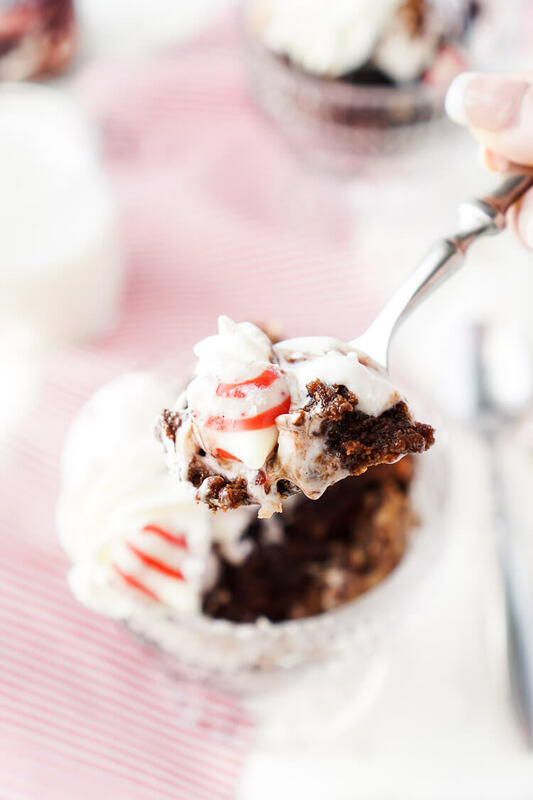 Pour batter into the prepared baking dish lined with parchment paper and drop unwrapped Hershey's Candy Cane Kisses on the top of the brownie batter. Sprinkle brownie batter with remaining 1/4 cup chocolate chips. Let cool in pan for about 20 minutes before removing but grabbing the sides of the parchment paper and transferring to a cutting board. Use a plastic knife to cut warm brownies. 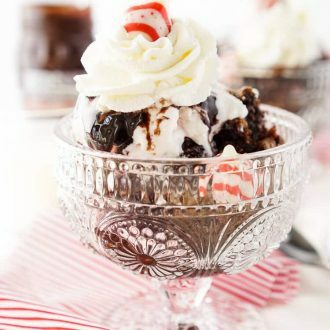 Add brownies to bowls and top with ice cream, hot fudge, whipped cream and additional Hershey's Candy Cane Kisses. I am loving all the light in your photos!!!! Way to go!!! These look amazing! I love the video!!!!!!! !